President Akufo-Addo says the objective of an integrated Africa cannot be achieved without peace and stability on the continent. 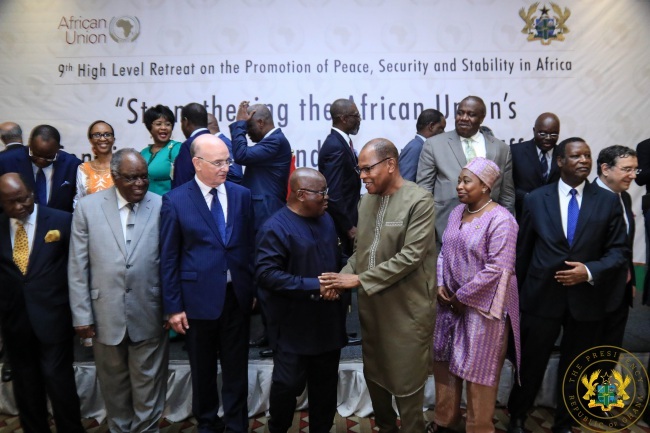 President Akufo-Addo made this known on Thursday, 25th October 2018, when he addressed a High-Level African Union Retreat on the “Promotion of Peace, Security and Stability in Africa”, at the Movenpick Hotel, Accra. Recounting the story of the formation of the European Union (EU), the President noted that it is a widely acknowledged fact that the formation of the EU has helped, since the end of World War II in 1945, prevent war amongst its members. History, he added, teaches us that Austria, Britain, France, Germany, and Italy had for centuries waged wars over religion, territory, and power. “The creation of a free market, concealing economic and geographical borders, was intended to erode the justification for using war as the quickest avenue to wealth and power and lessen its appeal. That was the vision that underlay the idea behind the European Economic Community, now the EU, in 1957,” the President said. “Those of us who believe strongly in integration can do no better than to give our full support to regional and continental decisions. Through this, we will build institutional confidence and integrity in the structural organs of the AU and our regional entities,” he added. To the AU Envoys and the participants at the retreat, President Akufo-Addo urged them also to focus on the creation of conditions for the elimination of pervasive threats to peoples and individual rights, livelihoods, safety, and life, through the protection of human and democratic rights, and the promotion of human development. With over 50% of Africa’s population under the age of 20, President Akufo-Addo noted that African countries must create opportunities and jobs for our youth, or they risk becoming instruments of instability or targets of recruitment by terrorists. “We must provide them with access to education; we must transform the structure of our economies from the raw material producing and exporting economies to value-added and industrialized economies, which will provide opportunities, jobs and hope to our young people to live dignified, productive lives,” he added. Equally critical, the President added, is the promotion and development, on the continent, of a system and culture of accountable governance, free of corruption, whereby the African peoples are governed in accordance with the rule of law, respect for individual liberties and human rights, and the principles of democratic accountability. “Such a system includes building strong institutions of the state, such as well-resourced Parliaments and Judiciaries, efficient law enforcement agencies, and effective security forces, that see their responsibilities and allegiances to the wider public interest, not just to the conveniences of the governments of the day,” President Akufo-Addo emphasized.